As I mentioned, going up via the new trail is a bit longer. The new trail is SMOOTH. We still like the old trail because it “doesn’t waste time”. Even though you must hike on baseball, softball, cantaloupe, and basketball-sized rocks. The History of Lyon Mountain, N. Y. So you took down my comments about you being the ones that are causing the erosion which results in the boulder fields you then complain about? Nice. So what do you think that nice smooth trail will look like in a few years? It will look just like the old trail, a washed out river bed!! The new trail was built with runoff in mind… as are most modern purpose-built trails. 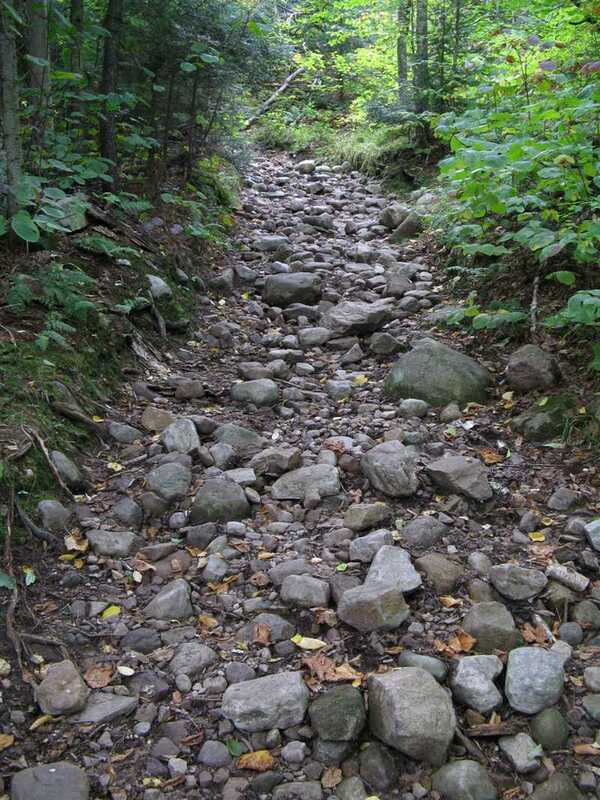 Water bars are strategically placed to keep water from running down the trail. I rarely ban comments, but you seem like you just want to argue. Not picking an argument. Just looking to point out that hiking has caused a great deal of dammage and erosion in the park. I like to hike, but some of that trail looks pretty rough. Maybe I’ll take the new trail. I just hope the park has it worked out for the best of both worlds…people and environment. If we can’t get close to nature, who’ll know what it was really like? Either trail is “close-to-nature”. Maybe you could leave the Kindle at home? Heh. Dudes, relax. enjoy the trail. Last fall we took the short way up and the long way down. The ascent wasn’t too bad but very wet since the water tended to flow down the easiest way. The return trail was much longer – my son kept asking “when are going to get there”. The long trail was muddier but went through some nice forest. By the way we went up the short trail with two 5 and two 7-year-olds. The fire tower is not for the faint of heart – the handrails in some places is only very insecure looking chicken wire. I wouldn’t let my kids up. I think the Southeastern-footer is more of a concern. There’s really almost nothing there. Just came across your site while doing some nostalgic searching of my favourite haunts as a teenager. We lived on the corner of Clark Hill Road and from our back yard I could see that silver tower shine throughout the year. When I was young, I used to stare at the fire tower wishing one day I could climb there. Way back in the day, Lowenberg Ski Mountain was developed and I was able to make a complete fool of my self, then it went belly up. Finally one summer morning , at 13 I asked my parents to drop me off at the old ski chalet, come back and pick me up at 6 pm. With back pack and supplies, and the innocence of youth, I started my adventure. That was a memory which will remain embedded with for eternity. I got to the tower and met the fellow who worked there. I was amazed at his job and the fact he would climb that daily during the fire season. I remember that he said he lived in the village of Lyon Mountain, he drove a four door mettalic green Jeep Willys and wore glasses. He took the time to explain how he read the circular map he had and how he radioed in at set times. I was surprised to see him there as I think he was surprised to see a young teenager show up alone at the summit. I loved the outdoors then as I do now. I now live on the Pacific Coast of Canada surrounded by mountains, but as strange as it may sound, these will never compare to what a young man conquered back in 1971. That was my coming of age, my experience that let me know that mother nature is what is important. I will always be grateful for that hike and the several more I did after that. Sadly I never ran into the kind man who took the time to explain how spotting for forest fires worked. One thing I am trying to remember is wheter or not he had a sign in book for visitors? One day I hope to travel back and do the hike again, on the old and the new version. 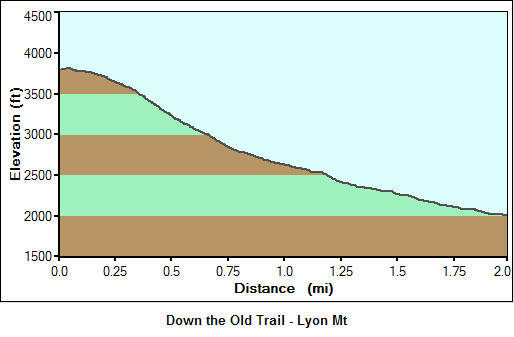 On January 23th, I attempted to hike the new trail up Lyon Mountain. However, after about 30 minutes, I had to retrace my steps to the junction with the old trail and use that one instead to get to the summit. The reason is this: the going on the new trail felt like”bushwacking” as the path is very narrow, there is a lot of ingrowth and the markings are insufficient if not absent. I decided to turn back and play it safe and stick with what I knew (the old trail), since the temp was about -15F at the base and there seemed to be no one else on the mountain that day (unbroken snow) Question : could it be that I veered off the trail somewhere along or is that new trail not really designed for winter use ? It’s possible, but the new trail is fairly narrow in spots. At this time of year, the rest of the forest is relatively “open”, so it is easy to miss the official trail if there is a lot of snow. I noticed the same thing while hiking the new trail in December. 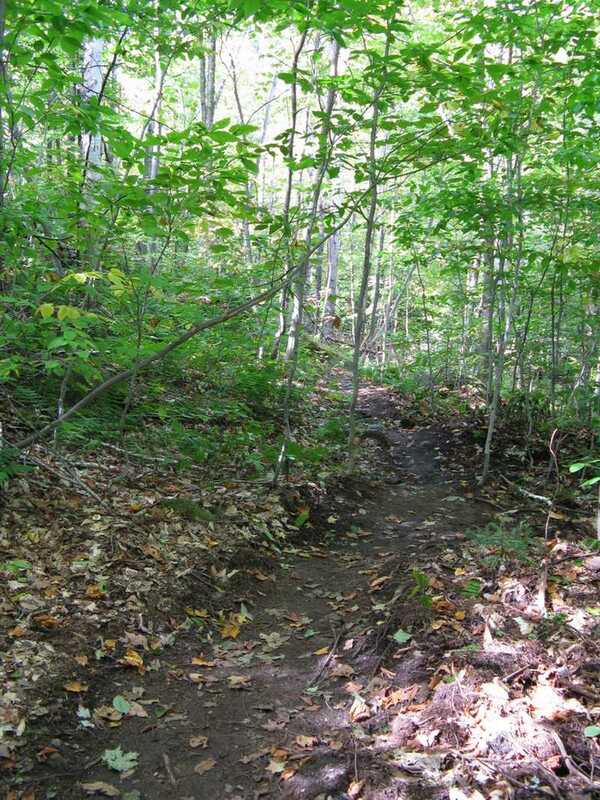 It can be hard to follow when there’s no vegetation bordering the trails. There were no footsteps to follow, but my dog new exactly where to go so I followed him through the questionable sections haha. We hiked the new trail yesterday and it was a pleasure. Beautifully done, couldn’t ask for nicer bridges and stepping stones. Liked the final challenge last section, but we saw trail crew who are working on rerouting this section due to erosion. Hiked Lyon on the new trail today. Had been up in July and had to go up that awful rubble in the old section. Not today. The new new section is complete and it is fabulous. I didn’t even notice the old trail coming in. Just crossed it and kept going on the new section. It’s well designed and the grade is friendly. suddenly I was on top. Totally blew me away. Just wondering what the total mileage is now. Also, there’s a register on the trail. 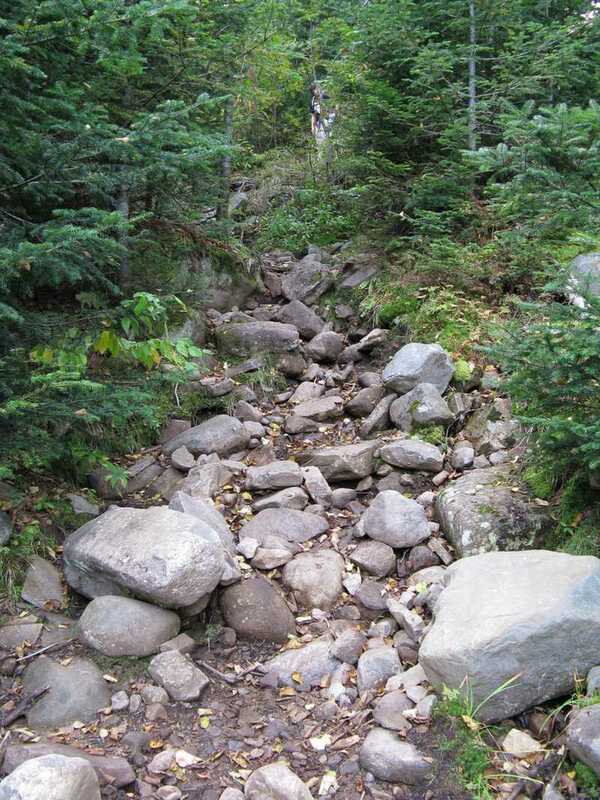 A real Adirondack climb. A new section at the top huh? A good reason to go for a hike. @Tony thanks for the info. Went for a hike with my nephew today 11/26/2011. There was a couple of changes since my last time up in March of 2011. The first notable change is a brown and yellow DEC sign at the intersecton of Chazy lake road and the unnamed gravel road to the parking area. Once I was in the parking area I noticed fresh paint blazes and survey pins. They were most notable at the base of the mountain but some pink survey ribbon was towards the summit too. The next observation was the addition of an offical trail register at the start of the “new” trail. The other observation which has already been noted is the extension of the new trail. The new trail ended at an intersecton with the old trail just before the summit. You can’s miss this “new section” it’s directly across from where the new trail intersects with the old trail. This new section bypasses ALL the nasty sections of the old trail but still joins the old trail just before the summit. This new extenison is a real jewel. It brings you past some neat rock formations. The forest itself in this section is also quite different/unique making for some great pictures. It was a welcome surprise on an already great day of hiking. Thanks for the update Mike. I’ve been wanting to update with the information about the final “new section”. 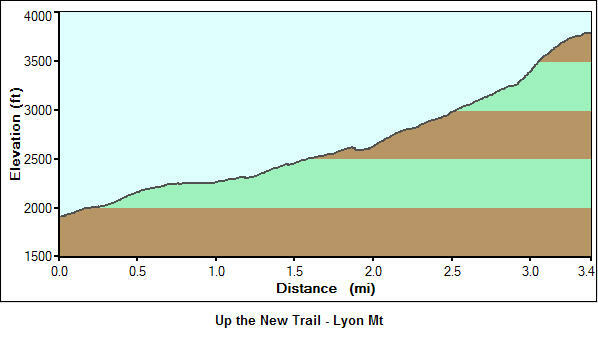 Went up Lyon this weekend using the new trail until it intersects with the old. We saw the trail markers for the extension of the new trail to the summit, but it was unbroken. Our MSR’s would not have provided enough float to use it. So we took the old trail to the top. On the way down we meet a group of about 8 (6 bare booters and 2 with msr’s) who had come up the old trail all the way from the parking area. The road to the parking area was well packed from snowmobiles and cars, although the pathway was a narrow one. Does anyone know how long the new extension is to the summit? The new trail extension is quite nice. It really only goes a short distance, but it adds 2-3 switchbacks and avoids the really steep section before the final flat-ish section near the top. Personally, I still like the old trail because I prefer a hard-effort over a long-slog. Nope, the “green trail” is correct – it’s the first-part of the new trail. There is also another portion of “new trail” near the top – I just haven’t added it yet. Either way, both trails go UP, it’s really hard to get lost on this hike. We hiked the new trail Aug fifth and found it to be an easy hike. We were able to jog down most of the new section and came back in 1.5 hrs. 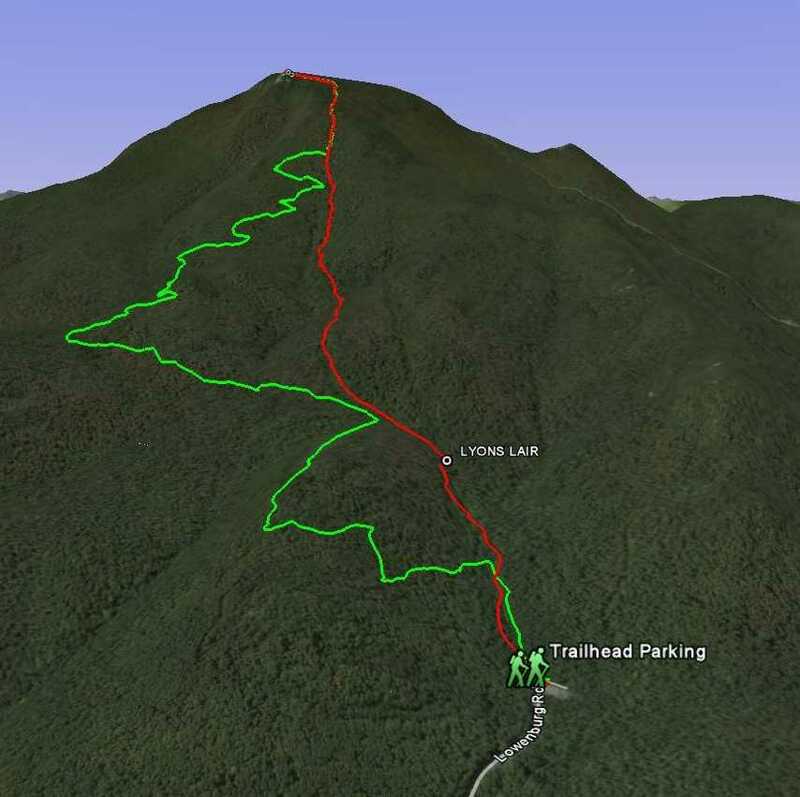 Next week we are going up the old trail and jog back the new trail. How much time does it take to climb by the new trail in winter, in average ? Or even, the roundtrip ? It would probably be between 1.5 – 2 hours, depending on trail conditions. I think it is actually easier with snowshoes.